"If you would be a real seeker after truth, it is necessary that at least once in your life you doubt, as far as possible, all things," urged René Descartes (1596 - 1650), one of the greatest minds of the Renaissance. For all the talk of globalization in our present historical moment, much of human experience remains rooted in the particular dimensions of local habits. Consider, for instance, the unique sportsworld that appears in many parts of the United States on Friday evenings during autumn. As noted earlier, one of the most important developments during the Neolithic Revolution was the development of more sophisticated forms of communication, particularly the earliest forms of written language, which developed about 5,000 years ago in the form of Sumerian cuneiform scripts and Egyptian hieroglyphics. At the start of this chapter, we asked an important question: How did we humans come to be the way we are today? This question is important not only because we all have a personal stake in the answer but also because it would have us seek answers to a fascinating mystery - one that might well be solved, at least in part, by better understanding physical activity, play, and other topics related to our own professional interests. 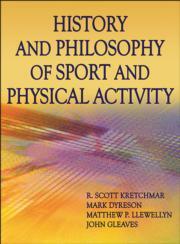 History and Philosophy of Sport and Physical Activity is designed to reduce any gap that might exist between good ideas and sound professional behavior. Historical lessons and philosophical analyses are seamlessly integrated. Readers will understand the intersection of history, culture, ideals, ethics, and professional practice from sport’s leading philosophers and historians. Chapter 2. The Transition From Endurance Predators to Farmers: The Birth of "Civilizations"
The Birth of the "Modern World"
The Renaissance, Neoclassical Revivals of Sport, and the "Nature of Man"